Understand the paternity test results provided by Genetic Testing Laboratories, how these will be formatted, the terms and vocab used and what you will see once you receive them is central to your DNA test. View sample results here. The alleged father is the biological father of the child tested. The result will show a probability of paternity of 99.99%. The alleged father is not the biological father of the child tested. The result will show a probability of paternity of 0%. GTL isolate the DNA from the buccal swabs and then test the DNA to locate certain regions of chromosomes that vary in length between individuals. These regions, or sites, are known as a ‘locus’ (plural ‘loci’) and we test 21 loci* to determine a relationship such as paternity or siblingship. Analysis of these 21 loci across a large population has revealed many different sized fragments, known as alleles, associated with each locus. These alleles are the genetic markers used in parentage analysis. Every human being has two of each type of chromosome, one inherited from each parent, and therefore everyone has two alleles at each locus. Sometimes these two alleles are identical (homozygous) but usually they are different sizes (heterozygous). The laboratory identifies the length of the two alleles found at each locus when performing parentage testing. The DNA report you will receive shows numbers in the first column that signify each of the 21 loci GTL have used in the DNA testing process. The columns marked ‘Alleles Called’ on the DNA test report contain numbers indicating the two alleles found at each locus. If the alleles are the same size then only one number will appear for that locus. For example: If a tested child has two alleles at a locus that are identified as 12.1 and 18 and the mother has alleles at the same locus identified as 12.1 and 16 then the child inherited the 12.1 allele from the mother. The child therefore has to have inherited the 18 allele from the father. This 18 allele is referred to as the ‘obligate paternal allele’. Generally, if he is the true biological father of the child, the alleged father must have this allele. We use twenty three different loci as genetic markers in our DNA tests, as well as one to confirm the gender of the person providing the DNA sample (Amelogenin). If the alleged father does not have the matching allele at all fifteen tested loci then he usually cannot be the true biological father. If the alleged father does have the matching allele at all fifteen tested loci then he could be the true biological father. We calculate a ‘Relationship Index’, indicated in the ‘Direct Index’ column on the test report, for each tested locus based on information including the portion of the male population that has the obligate paternal allele at that locus. This Direct Index is reported for each DNA locus. We then calculate a Combined Direct Index using the Direct Index data for all tested alleles which is shown in the Statistical Results section of the report. 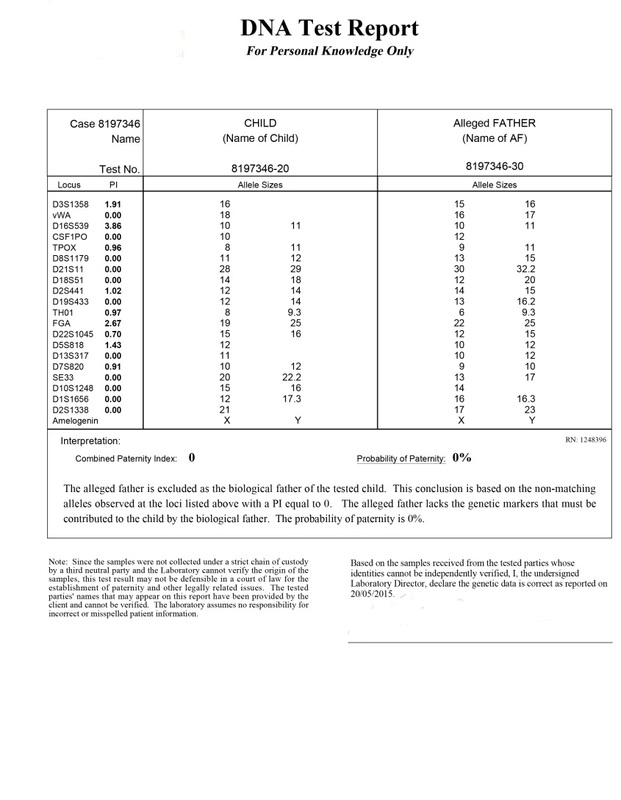 This Combined Direct Index is used to calculate the probability of the relationship which is the likelihood expressed as a percentage that a man with the alleles of the tested alleged father is the biological parent of the tested child, compared to an untested, unrelated man of the same race. 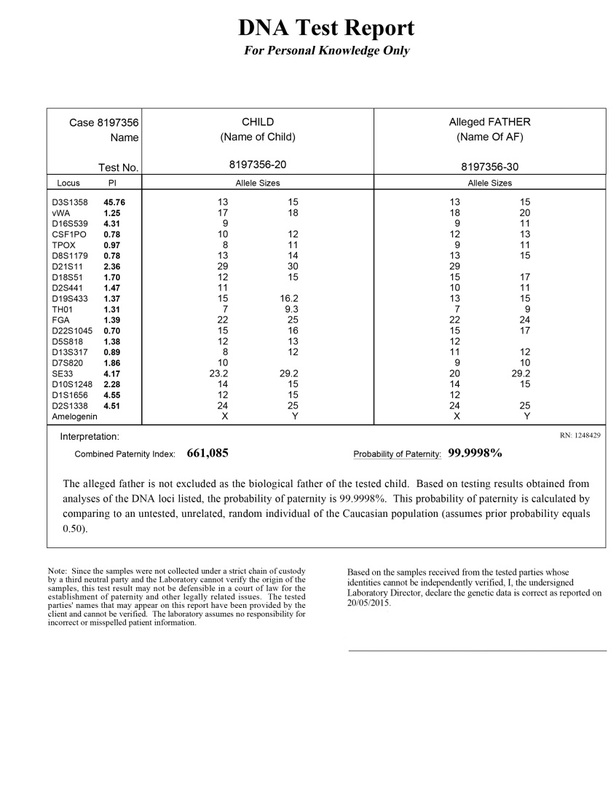 If the DNA of the tested alleged father is consistent with that of the tested child (to a degree of mathematical certainty) then the DNA report will conclude that the alleged father cannot be excluded as the biological father of the child. If the DNA is not consistent, i.e. does not match, the DNA test report will conclude that the alleged father can be excluded as the biological father of the child. * Each locus used in the testing of DNA is composed of a variable number of repeating short sequences of the bases A,C,T, and G: for example ACGACGACGACG. Each allele has a different number of repeats giving rise to a different fragment length amplified by the polymerase chain reaction (PCR).